Members of the Parliament and MLAs will not be able to become presidents, vice-presidents or chairmen or vice-chairmen of cooperative societies in Madhya Pradesh now. In many cooperative seminars this demand was raised in the past and the credit indeed goes to Madhya Pradesh govt for belling the cat. Even IFFCO MD Dr U S Awasthi, earlier in an interview given to this news portal supported the idea of keeping MPs and MLAs away from the top posts in cooperatives. The Madhya Pradesh govt has decided that they will be only given positions as representatives or directors. 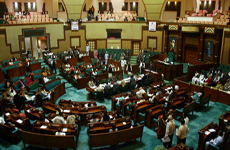 The state govt got the Madhya Pradesh cooperative societies [amendment] bill passed Thursday by the state assembly. The new Act makes it clear that with the end of the term the societies’ will be controlled by administrators. The latter shall have to hold election within six months. The period for elections to cooperative banks has been extended to one year. Apart from parliament members and MLAs, those elected to district panchayats, village panchayats, local municipal bodies, marketing boards or marketing committees will also not be allowed to become presidents , vice-presidents or chairman, vice-chairman of the societies, according to the new Act. Category I.–Societies, the area of operation of which extends to the whole of the state. (b) but extends to areas comprised in part of parts in one or more districts and the authorised share capital of which is more than Rs. 10 lakhs. This paved the way for Ministers to occupy offices of Chairmen of influential societies in terms of financial strength. A good decision by the state govt, i totally support it.